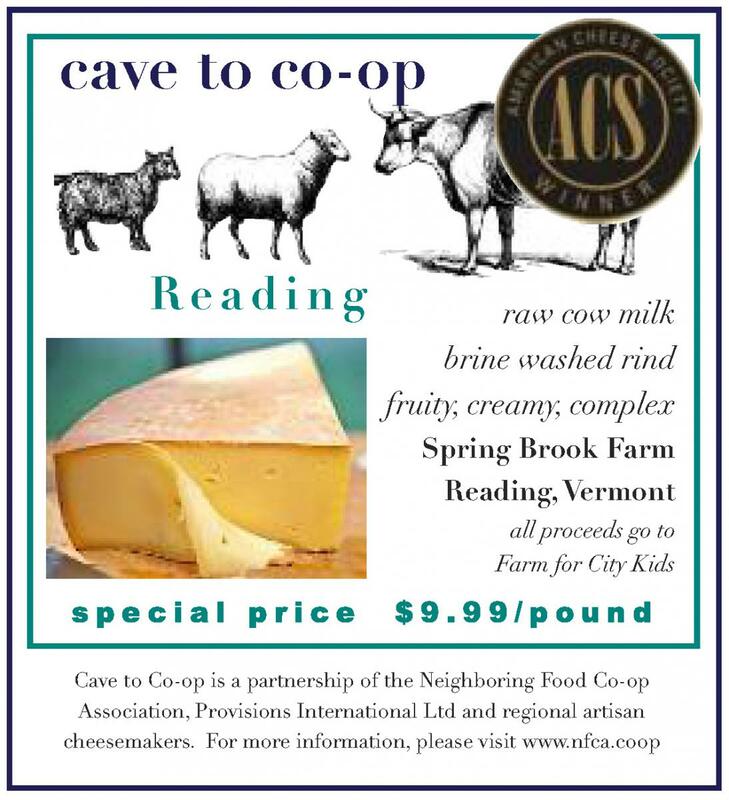 This month's special cheese is READING from Spring Brook Farm, Reading, VT. In May of 2010, with help and expertise from a French cheese making consultant, Spring Brook Farm produced its first make of Reading. Using the same copper vats and cheese making equipment used for their award winning Tarentaise, Reading is a semi-soft cheese ideally suited for melting over vegetables, breads or meats, yet it can stand alone on any cheese plate. It offers a creamy, nutty flavor that is again unique to this cheese coming from cows grazing in Vermont pastures. Reading is aged at least three months and given the same loving and patient care and nurturing the cheesemakers show towards their Tarentaise. Wheels average between 15 and 18 pounds. Tarentaise and Reading are made at the same farm that houses the Farms For City Kids Foundation. This non-profit has been in operation since 1994, bringing groups of children to the farm for a week at a time to experience a farm based curriculum. Besides learning to take care of farm animals and helping with making maple syrup (in season), the educational mission also includes helping with the aging of cheeses. The cheese house is designed to allow students and visitors to view the cheese making process through windows over the make room and offers a venue for students to study economics, chemistry, microbiology, food preservation, health, and nutrition. All funds from the sale of Spring Brook Farm cheese go to support the Farms For City Kids Foundation. “We are extremely proud of our Vermont made cheeses, the award winning Tarentaise and Reading, but we are even more proud of the work we do at Spring Brook Farm with the city kids. Their enthusiasm and sense of pride for everything they help with on the farm is priceless!” said Karli Hagedorn, Chair of the Board of Directors, Farms For City Kids Foundation. Reading is a beautiful cheese in the kitchen and with the start of fall, its versatility shines in these recipes. Use it whenever you want a great melting cheese. a wooden spoon to squeeze out as much water as possible. Undo the bundle. Mix the flour and the paprika, and dredge the leeks in this mixture. floured leeks and brown them lightly on all sides. until golden brown, about 20 minutes. Fill a large saucepan with 4 quarts of water, add the coarse salt and bring to a boil. Add the macaroni, bring back to a boil and cook for 15 to 20 minutes. Do not overcook. The macaroni should be ‘al dente.’ Drain well. To prepare the sauce, melt the 7 tablespoons butter in a saucepan, add the flour and mix well. Slowly stir in the milk, salt, pepper, and nutmeg and cook over medium heat, stirring constantly with a whisk until the mixture boils. Reduce the heat and let the mixture boil gently for a moment. Stir in the cream and about two-thirds of the Reading cheese. Continue to stir over low heat until the cheese is melted. Use the tablespoon butter to coat the bottom and sides of a gratin or baking dish. Arrange a layer of the macaroni on the bottom of the dish. Spoon a layer of the sauce over the pasta and then another layer of macaroni and continue to layer the macaroni, and sauce, ending with a layer of sauce. Arrange the remaining Reading over the top, and sprinkle evenly with the grated Parmesan. Bake for 20 minutes until the top is golden brown and bubbly. cooked in the center and golden brown on top. Let cool slightly on a rack and serve. Peel and trim the onions, slice in half and then into half rounds. Melt the butter in a medium skillet over medium heat and sauté the onions without stirring for 15 minutes. Then stir occasionally until the onions are caramelized and reduced. This will take at least 45 minutes. Add the wine, turn the heat to high and cook until the liquid has reduced to a thick syrup. Add the herbs, the broths and cider. Reduce the heat and simmer for 15 to 20 minutes. Pre-heat the broiler. Season the soup with a few drops of cognac, salt and pepper. Ladle into 4-oven proof bowls, top with bread rounds and the grated cheese. Broil until bubbly and golden, watching carefully, about 2 minutes. Serve.